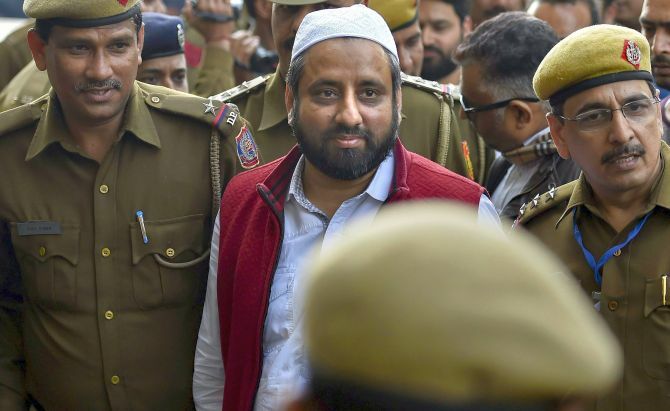 The Delhi Police on Wednesday got a jolt after a city court rejected its plea for custodial interrogation of the Aam Aadmi Party MLAs Amanatullah Khan and Prakash Jarwal, arrested in connection with the “highly sensitive” case of alleged assault on Delhi Chief Secretary Anshu Prakash. 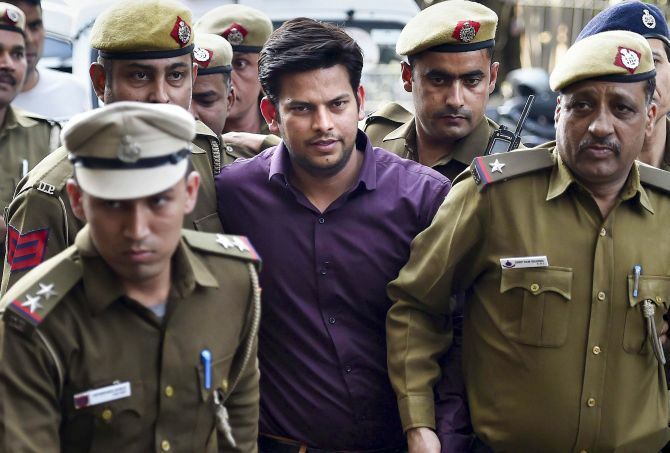 The two MLAs were sent to judicial custody in Tihar Jail till Thursday when the court would hear their bail pleas, after the police sought time to reply. Metropolitan Magistrate Shefali Barnala Tondon refused the plea of the Delhi Police to quiz them in custody for two days, saying that the legislators were ready to cooperate in the investigation and no case property was to be recovered from them, which was the basic purpose of police custody. “The basic purpose of granting police custody remand is recovery of case property which is to the exclusion of others, except the accused. In the present matter, the only ground which remains for seeking PC is to establish the motive and confrontation inter-se which is not the purpose of remand. Hence the applications are dismissed,” the magistrate said. However, the court sent them to judicial custody for a day while noting that there were criminal cases pending against both the accused and there was a probability of prosecution witnesses being threatened by the accused. 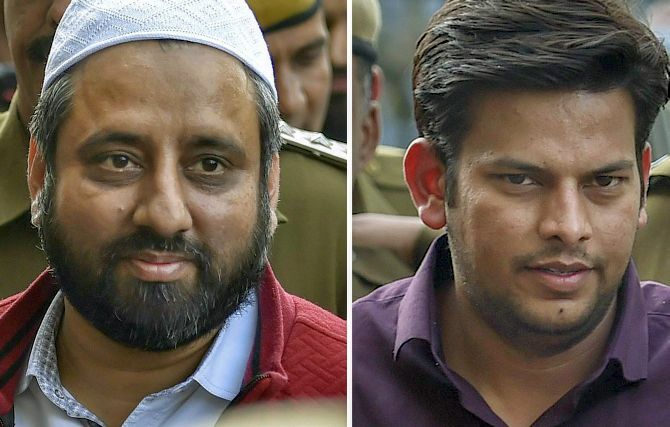 They were arrested in connection with the alleged assault on the bureaucrat during a meeting at Chief Minister Arvind Kejriwal’s residence on the night of February 19. While Jarwal, an MLA from Deoli, was arrested on Tuesday night, party legislator from Jamia Nagar, Khan, was taken into custody on Wednesday afternoon. “The grounds of judicial remand are found justified, as admittedly, there are criminal cases pending against both accused persons and likelihood of threatening the prosecution witnesses or tampering with the evidence cannot be ruled out. Therefore both the accused are remanded to judicial custody till tomorrow,” the court said. It also directed the concerned Deputy Commissioner of Police to personally monitor the investigations to ensure fair and impartial investigation. “It is a highly sensitive matter. Concerned DCP to monitor the case personally,” the magistrate said. In its order, the court recorded the submission of the defence counsel that medical examination was conducted on Prakash after the lodging of the FIR and nothing was to be recovered from the MLAs. IMAGE: AAP's Amanatullah Khan was accused of hitting Chief Secretary Anshu Prakash. Earlier in the day, top officers from IAS and Delhi and Andaman Nicobar Island Civil Services cadres had sought an appointment with President Ram Nath Kovind seeking action against those involved in the alleged attack. On Tuesday, a delegation of IAS and DANICS officers had met Home Rajnath Singh in this regard. The two MLAs were produced before the court on Wednesday amid tight security as a large number of AAP workers and lawyers were also present there. During the hearing, public prosecutor Atul Srivastava sought two-day police custody of both the MLAs saying they had committed a serious crime of assaulting and humiliating the senior-most officer of the state. During the hearing, the prosecutor submitted that a total of 11 persons were involved in the incident and the two MLAs have to be confronted with other accused to unearth the larger conspiracy and the role of the other accused, who are yet to be arrested, also needed to be ascertained. He also claimed that it was a serious case of assault and the two MLAs were not cooperating in the probe. Countering the allegations, Joon said the MLAs were ready to cooperate in the probe and alleged that the charge of assaulting public servant was invoked in the FIR without conducting the MLC of the bureaucrat. He also submitted that as per the footage of the CCTV installed at the chief minister’s house, the chief secretary’s vehicle entered and exited within 7 minutes and 8 seconds. In his complaint, Chief Secretary Anshu Prakash had alleged that the two legislators “started hitting and assaulting” him at the meeting “with blows on head and temple”. The AAP has denied the allegations. A case was registered at Civil Lines Police Station in north Delhi on Prakash’s complaint for the offences including those punishable under sections 186 (obstructing public servant in discharge of public functions), 353 (assault to deter public servant from discharging duty), 332 (voluntarily causing hurt to deter public servant from his duty), 506 (criminal intimidation) and 120B (criminal conspiracy) of the IPC.